Israeli forces have escalated land confiscation throughout Bethlehem during the past several days, targeting Umm Salamuna in the south and Beit Jala in the west. The Israelis are building the Wall through Bethlehem, further isolating the West Bank from Jerusalem. Thousands of Palestinians will be segregated from one another, human rights sources report. 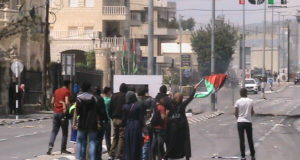 In the Bethlehem District’s southern town of Umm Salamuna the confrontations continue between the large contingent of Israeli forces who are confiscating the land and the residents who are trying to stop them. 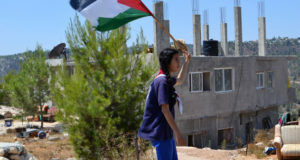 Joined by foreign and Israeli supporters, the land owners have taken to standing in front of heavy equipment in the campaign of nonviolent resistance mounted over recent weeks. On Wednesday demonstrators held sticks to the soldiers’ machine guns. 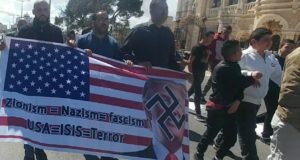 Israeli forces violently arrested five Israeli and two foreign supporters. Mahmoud Zoahrah is a member of the Wall Resistance Committee in southern Bethlehem. The group represents 10 area towns and was formed several months ago to combat land confiscation and Wall construction. Ibrahim Attallah is among residents of western Bethlehem’s Beit Jala City whose home is slated for wrecking. He has two weeks to appeal the Israeli decision in the Israeli court system. The 100 residents who the Israeli authorities intend to evict in order to expand the settlements and Wall have agreed to collective action and say they will not leave their lands or homes. In addition to destroying the stone fence surrounding agricultural land near the Talitha School in Beit Jala, over which the Israelis have under full control as Area C, Israeli forces are targeting the entire area for Wall construction. Al Azzeh said that Israeli forces deliberately demolish houses during the early morning hours to avoid any major protest by land owners. He pointed that the Israelis claim the reason behind the destruction is that Palestinians have not solicited them for licenses for the existing structures. But the real reason, says Al Azzeh, is completing the Wall. Beit Jala will be surrounded by settlements, the settler bypass road and the Wall after the land is confiscated. The same appeal that is circulated almost daily was issued again to international human rights institutions to pressure Israel to abide international law and stop the decades of looting Palestinian lands. “Dredging and demolition do not enable the search for a just peace,” commented Al Azzeh. Beit Jala’s Mayor said that the demolition order to establish the Wall here will lead to the isolation of approximately 7,200 dunams of agricultural land. The only access will be through an iron gate in the Wall, and that is dependent on the mood of the Israeli soldiers, forewarned sources in the municipality.